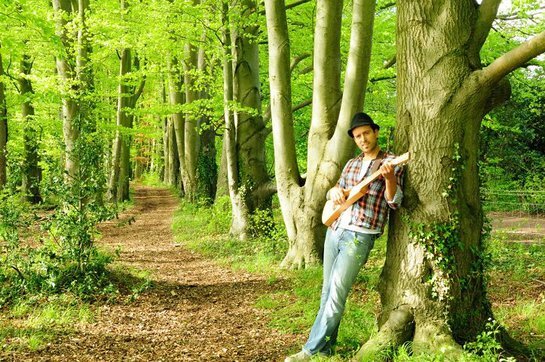 On Saturday 2nd June, tree surgeon Ben Trevor will scale the tallest tree in his home county of Surrey, serenading his audience and entertaining music enthusiasts all over the world by performing a mini-concert at the top. His Tree Top Troubadour charity campaign, which has already attracted the attention of local media and celebrities and raised over £1000 in sponsorship for the Royal Marsden Cancer Charity, will be filmed and turned into a documentary with the help of fellow climbers and local filmmakers. Saturday’s event is the first in a series of three climbs which Ben hopes will continue to raise awareness and funds for the cause – chosen after his mother was successfully treated for breast cancer at the Royal Marsden Hospital. ‘We were all so relieved when my mum got the all clear, and obviously very thankful for the amazing care she’d received,’ explains Ben. Following Saturday’s performance at the top of a 140ft Douglas Fir just off the A24 in Surrey, the intrepid tree surgeon’s sights are firmly set on the tallest trees in the UK and the World respectively. He is already working with top tree expert Iain Duncan towards a second performance atop the 210ft Grand Fir in Scotland before the end of Summer 2012.
auction his own guitars to raise further money for the charity. The unusual method of fundraising has already grabbed the attention of former motor-cycle world champion James Toseland, who has pledged his support; and actors Andy Beckwith and Brian Blessed, who have agreed to record video messages of encouragement and inspiration. Rock star John Parr has agreed to perform a version of his classic hit St Elmo’s Fire at the start of the Scotland tree, and is currently assisting Ben in rewriting the lyrics for the Tree Top campaign. More information about the Tree Top Troubadour campaign can be found on their Facebook page. Information about the Royal Marsden Hospital and Cancer Charity can be found at www.royalmarsden.org. Donations are welcome at www.justgiving.com/treetoptrobadour or you can show your support by following @treetoptroub on twitter.